As for this preggo lady, I'm really just taking it day by day right now. My doctor prescribed some medicine for nausea, which has been helping some, but I still feel a lingering heaviness in my throat/chest (it's so hard to decipher what's really going on in there!) Yesterday was really bad, and today was good- I really never know what each day will bring. But I'm learning to TAKE ADVANTAGE of the good days! Today I finally felt good enough to actually make a weekly menu plan (without gagging) so I feel quite accomplished! I also went grocery shopping ALONE thanks to my wonderful hubby. AND I cleaned up the apartment- I even dusted! But tomorrow could be different. I may find myself laying on the floor watching Silas play while dirty dishes and laundry just sit and wait. And that's OK to. If this pregnancy is anything like my pregnancy for Silas I'm halfway through the worst of it, and that gives me hope! And I'm really looking forward to next Wednesday when I'll get to see that little heartbeat. I know that'll inspire me even more! I'll leave you with a little creativity before I close. I've been flipping through and getting some neat ideas to help fill Silas' and I's days. Our first activity was to create a "sticky figures" board. I took one of his puzzles and used the back to create the board. I bought some Velcro and a cheap bag of plastic bugs and there you have it! 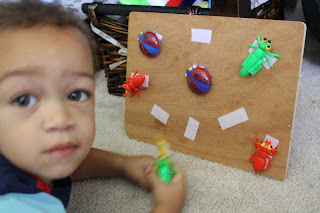 Silas enjoyed helping me stick the Velcro on the bugs, and he loves playing with his bugs- mostly without the board though! But it was a fun activity to do together, and it filled some time in our day. I'm looking forward to many more great activities! Looks like this book will be a keeper!